Help family and friends, reap the rewards! Thank you for choosing WeatherMakers Heating, Cooling, and Plumbing. Weathermakers’ Referral Rewards Program is our way of saying thank you for your kind endorsement. Start earning rewards for the referrals and recommendations you are already making. Print the attached friends and family $25 SERVICE GIFT CARD or $100 REPLACEMENT GIFT CARD. 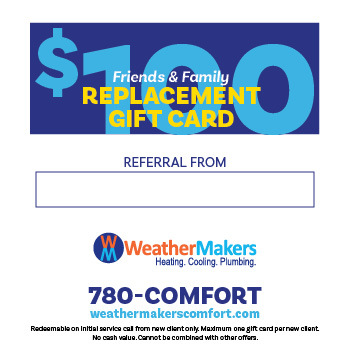 Write your name in the field on the gift card and give it to a friend or family member who has never contracted WeatherMakers before. When they redeem the gift card, you will collect the referral reward, and they will receive the discount. It’s that simple! Gift Card is redeemable on initial service call from new client only. Maximum one gift card per client. Gift card is redeemable on installation of a furnace, air conditioner, on-demand water heater, or boiler from new client only. 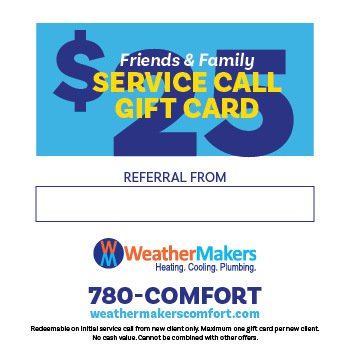 If you have any questions about our Friends and Family Referral Rewards Program, or wish to schedule heating, air conditioning, indoor air quality, or plumbing service, please call WeatherMakers at 780-266-3678 (780-COMFORT) or use our online request form.